Scrub yourself to silky soft skin, with this exciting product from Soap and Glory. The main quality of the Soap and Glory products which really stands out, is the absolutely gorgeous smell. The packaging is also refreshing and full of character, making it really stand out on the shelf. The Scrub of Your Life is designed to rub all over your body, to make it look and feel as smooth as possible. All you have to do is get into the shower, scrub with the the body butter and then rinse off. Simples! If your elbows and shins are feeling a bit rough and dry, this is the perfect product to make them feel wonderful. It can also get rid of bumps on the backs of arms, and make your whole body look, feel and smell amazing. The gorgeous smell of this product comes from a range of ingredients, including fresh bergamot, rose, oakmoss, amber, jasmine, peach and warm vanilla. The combination of these all together, is just like a little taste of heaven. You can use it on its own, or team it up with the wide range of other Soap and Glory products on the market. This range is constantly being developed, with new products being introduced all the time. It is not tested on animals either, so if you are an animal lover, you can use it without feeling at all guilty. The compact 50ml size of this scrub means that you can just throw it in your suitcase and take it on holiday with you. You won’t want to be without it after you see the results, and who could blame you! 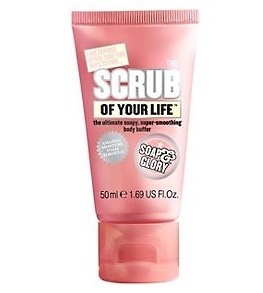 Soap and Glory Mini The Scrub of Your Life (50ml) is available from Boots and is priced at £2.35.